The rate of growth in global gold mine production has been slowing and mine supply is expected to record its first yearly decrease since 2008 in 2016. The lower mine supply is likely to continue for several years, owing to a thinning global project pipeline, with most projects in the pipeline for 2016/17 being small or medium-sized projects. South African gold miners have, meanwhile, benefited from a strengthening rand gold price, but production is expected to continue declining, as a result of the depth of the country’s gold mines and declining grades. Gold mining companies are also faced with rising input costs, particularly higher electricity costs, and the impact of industrial action by employees. 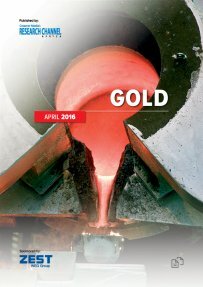 In this context, Creamer Media’s Gold 2016 report reviews the global gold market, with a particular focus on the South African gold sector, including issues such as supply, labour, and electricity shortages, as well as major and smaller mining companies with operations in South Africa.